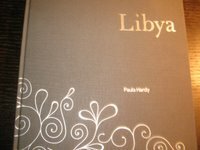 The long-awaited book, Libya by Paula Hardy, has finally arrived. I've been waiting for this book since it was published in 2003. I've ordered it online a couple of times, to be told after months of waiting, "Sorry! It's not available." Last I ordered it was in September, and it arrived on Tuesday, Eid day--nice gift! Turned out it's worth the wait; very nicely presented. It's the first of its kind on Libya--buy it! The reason behind my desperation is that my father is featured in this book. Moody was thrilled to know that and see his pictures. He asked me to read it to him many times! Now Moody wants to take it to school to "show my friends and teachers Grandpa and read it to them..." I might take it myself one day and hand it to the teacher; it's too precious to let go of so easily! I have a couple of people in mind to give a copy to as a gift and might also order 3 more for us, one for each of my children. Well, that has to wait--it's quite pricy as it is. We still don't know how to deal with Moody and how to react to his behavior at martial arts that got him on probation. We just told him there will be consequences, and we're still thinking about it. We had a session with Donaldson and didn't get an answer yet! My inclination is to pull him out of martial arts, but it's kind of late now and might send him the wrong message. We should've done that earlier when we saw signs of the trouble coming ahead. What do we do so he doesn't get the wrong message that this kind of behavior is what gets him what he wants? Still a puzzle! We had fish for dinner, Red Snapper, and decided to at least double the amount for next time. I didn't have my fill, neither did Sol, I believe. The kids just kept asking for more; how could we not comply! I have noticed lately how the amount of food we consume has increased significantly. Previously, when I cook a dish, stew or soup for example, it would last us for at least two meals and a half. Now, it just does for one meal! I made Sharba yesterday and what's left is barely enough for one person. The kids have grown! I'll have to upsize the pots and pans and hopefully not mess up the taste--the result is not the same when I change the quantity. I attended a resume-writing workshop last week and got some feedback on my resume. I got to the task of polishing it over the weekend; it looks and reads much better now, and I'm quite happy with it. Today, I sent an update on the status of the Tibra Awards for this year. Hopefully that'll get us some response. Too bad Libyans don't know the value of such a project! I'm afraid they'll realize it when it's too late. If you're reading this, do something... please! Oh, Moody wants to go to China! He's been saying that for months, and now he adds "... and I will eat bugs in China!" Please let me know how you ordered the book on Libya. I would like to purchase a copy for my husband. Thanks. I want to order this book too .Thanks Hanu , I had never heard about it before. I apologize for not replying sooner. I didn't realize I had changed my setting to moderate the comments and never checked them! It might take long for you to get it, but you will eventually. Thanks for the info. I'll order it right away. Back to normal... or is it?